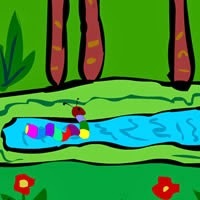 Cartoon Worm Escape is edition of point and click Rainbow Worm escape game created by Ainars, sponsored by EscapeFan. Investigate 4 rooms, find all medals, keys and press on all buttons, switches in order to obtain exit key and escape. Good Luck!